Somewhere in my early 20’s I became a minimalist when it came to possessions long before it was in vogue. I married someone who did not think the same way (some things you do not learn until after you are married). Over the years things piled up. Back in early 2014 I started the biggest spring cleaning ever undertaken by man…at least this one. During the 28 years of marriage just about everything was kept by my ex-wife (and after the marriage too). Once the initial cleaning was complete it was time to tackled the file cabinets and boxes, along with the computer, with the intent to either destroy or retain for future reference anything important. In the end there was very little that did not end up in the recycling bin. When the initial shred feast was over, five 60 gallon recycling cans of shredded paper was hauled away. My ex-wife also became the source of a lot of misinformation that was shared with friends and acquaintances. This started about 18 months before the dissolution of marriage was filed. Many have stated that they never believed what was said about me. Others have been led astray only to discover the truth after being confronted with the facts (several blogs posts have been written about this experience). During my ex-wife’s cancer treatment she utilized Caring Bridge to keep family and friends up-to-date on her journey. The last post on Caring Bridge is relevant to finding the truth. I still have no evidence of current disease! I was seen at Stanford for another pain trial which really helped! I have tried a couple of other pain treatments with Kaiser which have helped also! I had a wonderful vacation with my extended family in June! I have had many opportunities to spend some real quality time with HollyAnn and Bill…I’ve been working on that bucket list! Even after all the pain treatments, the pain is still there. The Stanford treatments give only temporary relief. I still have to deal with health issues related to the initial treatment. After 2 years of marriage counseling, I have decided to call it quits. Cancer is ugly. Divorce is ugly. Fifty percent of all married women diagnosed with breast cancer end up with a divorce. So that’s the summary. As you can see, the good in my life far outweighs the bad and the ugly! I am so thankful for my family and their support, and my friends who are supportive also. I’m in a new place. I’m looking to make some changes, but I’m generally happy with where I am. As always, I am thankful for all your support! The marriage counseling actually lasted approximately 16 months but two years sounds like a lot more effort was put into the process. Some time after this last Caring Bridge update, my attorney and I were waiting for information, either in the court hallway or at her office, when she shared from her experience what happens when the divorce is final. She stated that one party comes out okay when all the dust settles and the other struggles to make it. My attorney felt that everything would work out for me when all was said and done. My attorney was spot on in her prediction that I would do okay. While divorce was not in the original plan, the result has been far less stress. 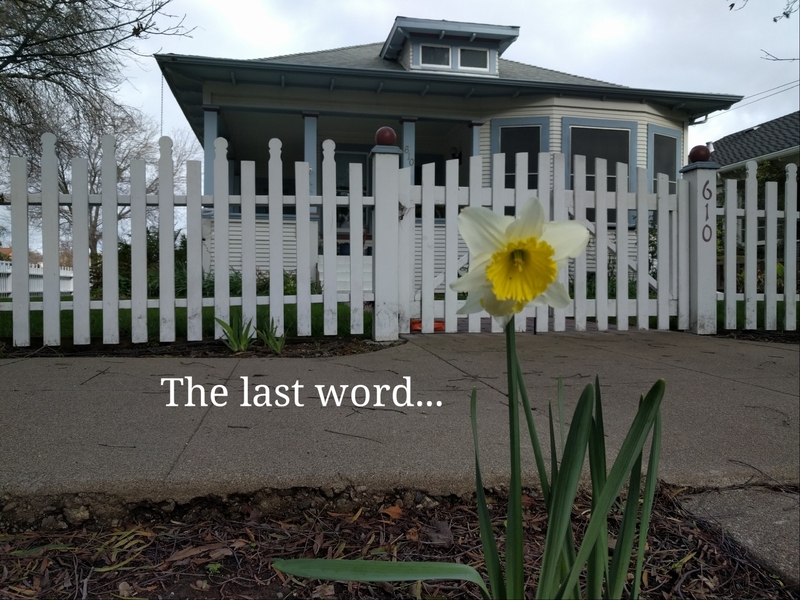 The daffodil pictured above has survived several dry winters without blooming and is now making the world a happier place. Being mindful has been one of many keys to opening the door to renewed happiness. Like the daffodil, I will thrive. Beautiful. I like to think that somewhere the universe hold The Truth. But it is ever clear to me (as I am threatened to be taken back to court) that one person’s truth can differ quite greatly from another’s. One of us in nuts, right?!? So happy you have found peace and joy in your life. Thanks Nancy! Best I’ve been in a long, long time. Sometimes it takes going through hell to get to a better place.